IT IS the ancient hobby that has people buzzing again. 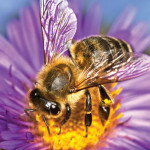 Amateur beekeeping or “urban beekeeping” as it is now referred to by its trendier moniker, is swarming in popularity. 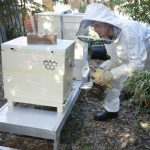 And given May is “honey month” the Express Advocate has turned to Central Coast Amateur Beekeepers spokeswoman Barbara Elkins to lift the lid on things you never knew about bees. The 72-year-old said the first thing to realise about bees was just how important they were with the latest scientific evidence suggesting that if bees were wiped out by a global endemic, the world’s agricultural production would collapse within four years. Central Coast Amateur Beekeepers Association spokes woman Barbara Elkins and her bees. Commercial honey production has been hit hard with large tracts of the country in drought but Ms Elkins said this year’s endless summer had proved a boon for amateur beekeepers. Ms Elkins said the club had grown from 30-40 members eight years ago to well over 100, with members Robyn Crossland and Ray Isaacs taking out top prizes for bees wax at the National Honey Show held at the Royal Easter Show. She said Max Rae and Len Verrencamp also won a couple of major first prizes for their honey. Ms Elkins said she got bitten by the bee bug at 10, acting as a “goffer” for her father who suffered bad reactions to beestings despite a love of keeping them. “I remember going out to the clothes line and seeing a swarm on it and me going out to collect it,” she said. It was only much later the grandmother of 10 joined the bee club “to be a bit more social”. The club has recently been offered 25 places for members to study some units of the Certificate 3 in Beekeeping online through Hunter Valley agriculture school Tocal College. While bees have been kept since ancient Egyptian times Ms Elkins said it was only now scientists have been able to start to uncover the secret life of bees. “Generally it was thought bees don’t go from one hive to another because they have the smell of (their) queen, but now micro GPS trackers have found they have little ‘pyjama parties’,” she said. ■ Without bees scientists predict the world’s agriculture production would collapse within four years. ■ A queen bee will lay up to 2000 eggs a day. ■ A typical worker bee (female) only lives for about four-to-six weeks. ■ Queen bees live for about four years. ■ A new queen will mate with up to 10 drones before she starts a new hive and keeps the sperm viable for the rest of her life. ■ Urban beekeeping is important to maintain bees’ genetic diversity. ■ To keep bees people have to be registered with the Department of Primary Industries. 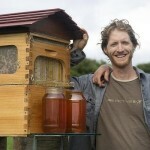 ■ Some hive designs are banned in Australia because they cannot be inspected for disease. ■ Bees keep their hives air conditioned by regulating their temperature. ■ Some naturopaths believe eating raw local honey can ease hayfever for sufferers in that area because it contains trace elements of surrounding pollens. I have a hive of trigona which I need to split . 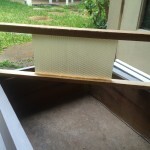 Have you anyone that can do this and supply a new hive as well . I live at Narara . Kind regards , Dennis Robinson . Copyright © 2019 Central Coast Amateur Beekeepers. Powered by WordPress. Theme: Spacious by ThemeGrill.